My last night in Austria I went out for dinner with Lily, a fellow Canadian blogger from Explore for a Year and wanted to try more food in Austria. There didn’t seem to be anything as iconic as wiener schnitzel, which is breaded pork. I am very familiar with the breaded meat category and had eaten my fair share of milanesa in Buenos Aires although I can’t say I’m a fan and suspect that historically meat must have been breaded and deep fried when it was a cheap cut or bad meat. We ate in the Innsbruck main square so the tourist restaurant gave us a bit helping of salad, which was nice to see. However, I couldn’t escape the saltiness that seems to be prevalent in everthing that I have eaten here. I cook so I’m not afraid of salt and think most food could use more of it but it felt as it there was so much sodium my fingers were already beginning to swell. I won’t say that I’m giving up on food in Austria but I wouldn’t eat it in the main square again. Ha, you aren’t missing much. Never eat in a main square in Europe! Usually those are reserved for tourists and are not regarded as places where cuisine must be good to stay in business. Austria has wonderful food! You just need to try places off the beaten path. There is a lively town in the hills called Alpbach that has gorgeous scenery, friendly people and delicious food. If you have time you should head up there. Rooms this time of year are around €25/ night including a hearty breakfast. Try Haus Sonnwend (Gitte runs it and she’s a lovely hostess!) or Hotel zur Post. Gastof Post has fabulous food as does the restaurant across from the church. Also, the little huts in the hills are fabulous while you are hiking! I hope you get a chance to see “real” Austria! I know, such a rookie move to eat in the square although all of that side of Innsbruck seemed the same. I won’t write all of Austria off! It should be veal, not pork. The schnitzel-countries tend to be pretty strict about it. Maybe that was part of the issue, I also thought it was veal and asked but our waitress said it was pork. I quite like weiner schnitzel! So much so that when I was in Vienna last Christmas, I had it three times within 24 hours. You know I think breaded meat may not be my thing, I wasn’t a big fan of milanesa either. Now I want something salty! How can you not like Wiener schnitzel?! 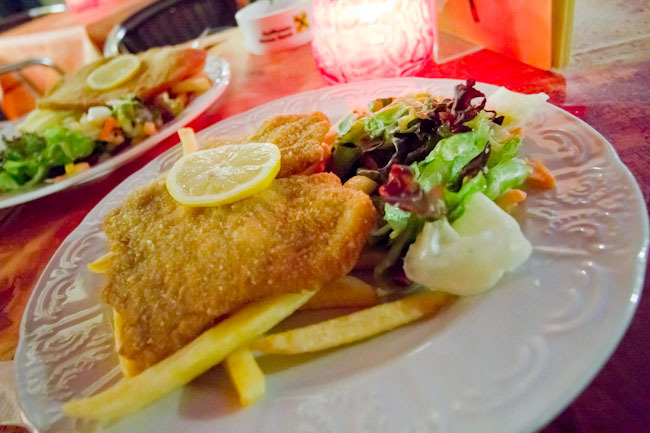 That’s not a great way to serve wiener schnitzel – with chips, it’s like the output of a slightly more exotic KFC. And Austria is *not* a slightly exotic KFC. Next time, look for the stewed elk. No, really. The only memorable food I ate in Austria was cake! In the U.S., Wienerschnitzel is most commonly found at German-style restaurants. These restaurants usually use the term Wienerschnitzel to refer to the dish made with veal cutlet, and may also serve other “Schnitzels” made with other meats. I have to agree that That’s not a great way to serve wiener schnitzel with chips. Yum, this reminds me of parmo in Middlesbrough (England). It’s like a chicken schnitzel with melted cheese.